In this April 2, 2018, file photo, Luiz Inacio Lula da Silva attends a campaign rally in Rio de Janeiro, Brazil. 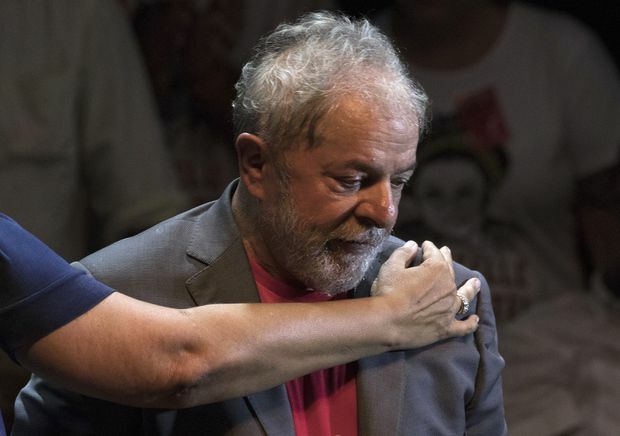 Brazil’s Workers’ Party on Tuesday replaced jailed former President Luiz Inacio Lula da Silva as its candidate for October’s general election, clarifying one of the biggest question marks hanging over the vote to lead Latin America’s largest nation. The party confirmed the move after a meeting of its executive committee in the southern city of Curitiba, where da Silva is jailed. Fernando Haddad, a former Sao Paulo mayor, will lead the ticket and be joined by Manuela D’Avila, a member of Brazil’s Communist Party. Da Silva is serving a 12-year sentence for trading favours with construction company Grupo OAS for the promise of a beachfront apartment. The former president, who governed between 2003 and 2010, has always denied wrongdoing, arguing this case and several others pending against him are meant to keep him off the ballot. Da Silva led polls for more than a year, but his candidacy was recently barred by the country’s top electoral court. The court gave the party until Tuesday to replace da Silva. In a lengthy letter distributed by the Workers’ Party, da Silva recounted what he called “lies and persecution” that he and his family had suffered and urged supporters to vote for Haddad. “Today and going forward, Fernando Haddad will be Lula for millions of Brazilians,” wrote da Silva. The strategy of holding on to da Silva’s candidacy until the absolute last minute caused much internal fighting within the party. Many believed that leaving Haddad so little time to present his case to voters was risky, while others thought it was best to keep da Silva front and centre as long as possible. Rival candidates have frequently taken shots at Haddad, attacking the centerpiece of the party’s strategy: his dependence on da Silva. Brazil will have “a little president” if Haddad is elected, said left-leaning candidate Ciro Gomes last month. “The theatre of the Workers’ Party is over,” right-leaning Geraldo Alckmin said Tuesday. Recent polls show Haddad far behind, but the party hopes he will now rise with da Silva’s endorsement. The current poll leader is far-right congressman Jair Bolsonaro, consistently over 20 per cent in a race that puts several candidates at around 10 per cent. A Datafolha poll published on Monday shows Haddad in fourth place, favoured by 9 per cent. That was a rise of five percentage points in just a few weeks, but still behind Bolsonaro’s 24, Gomes’ 13, centrist Marina Silva’s 11 and Alckmin’s 10 per cent. If no candidate gets more than 50 per cent on Oct. 7, a runoff will be held on Oct. 28.